The MAVEN spacecraft, recently arrived at Mars, detected the comet encounter in two ways. The remote-sensing Imaging Ultraviolet Spectrograph (IUVS)—designed and built by LASP engineers—observed intense ultraviolet emissions from magnesium and iron ions high in the atmosphere in the aftermath of the meteor shower. 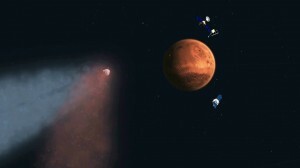 Not even the most intense meteor storms on Earth have produced as strong a response as this one: The emission dominated Mars’ ultraviolet spectrum for several hours after the encounter and then dissipated over the next two days, according to the MAVEN science team.